Building and growing your own real estate business is not quite like making a business out of anything else. Sure, in every example you are your own boss and do not have to answer to anyone else, but that’s where the similarity really ends. It may be easier to start a business, say, walking dogs or making treats for people, but real estate is much more rewarding. Think of it, everyone needs a place to stay, so it is not only financially rewarding but also will just give you that proud feeling of being instrumental in making a house someone’s home. Growing own real estate business is not for the faint of heart. 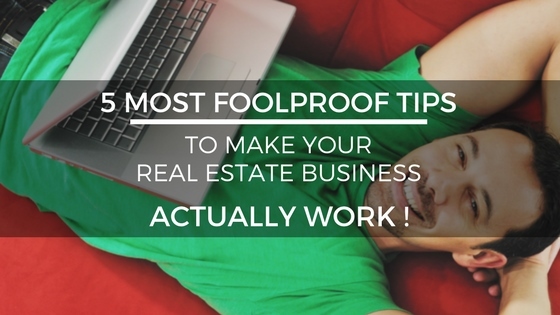 You will likely have put in many years as a real estate broker working for someone else before you have enough clients and know how to really make it work. How to do it: It may seem like a no-brainer, but perfecting the art of talking about your business to people who can help is key. This is not just limited to boring people talking shop over a few cocktails. The truth is, you never know who you can meet, so it is imperative you worm talk of your business into every interaction. Met someone while stopping for your morning coffee? They could be in the market for a new home or know someone who is. Don’t idly dismiss them, instead talk about your business like it is the most exciting thing around. Do not think it all has to be facts and figures, which are likely boring. Instead, talk about the feeling of helping people find a new home and how it makes you elated and always ready for more. How to do it: One thing that is absolutely most important to have a business succeed is having easy access to funds. You may not be solvent yet, and your business isn’t the perfect money-making machine you envisioned. That is okay! Real estate commission advance is kind of perfect for you. The way it works is you reach out and find someone to buy your commission before you receive it, and you get a large cash sum immediately. You make them the beneficiary of your commission, and you get to enjoy the money now. This is not a loan. Instead, it’s a sale of what is already yours for something you really need! How to do it: If you have leads, it may be kind of obvious, but please do not hesitate to contact them. Whether you call, email or send a carrier pigeon, it is all about making contact and helping them find what they really want. If you do send an email, put your number at the bottom. Make it super easy for them to get in touch with you. If your business has grown to such a proportion (something we all want) that you can not find time between scheduling meetings, seeing clients, and maintaining your precious sanity, consider hiring an assistant. They don’t have to be in-person and always holding your coffee, but even a virtual, digital assistant will help you accomplish your dreams. When you first go down this road, have a concrete list of easy to accomplish tasks. This is the best way to achieve your dreams and make everything possible for your new business. It may seem like something you’re not equipped for, but using Facebook or Twitter to grow your real estate business is very easy. You can hire a social media guru, but it is just as easy to figure it out yourself or assign it to your virtual assistant. These sites are not just for adding photos of your family or sharing funny memes anymore. The reach is huge, and the payoff can be much more rewarding than the work you put in. There you have it, our five best tips for making your real estate business the stuff of dreams. Just remember, you cannot do everything yourself, so having an assistant is a godsend. If you don’t want to spend too much on advertising, social media can be your best friend. If you need money now, a commission advance is exactly what you’ve been waiting for. What is a Real Estate Advance Commission? How Much Should I Charge for Real Estate Commissions?